7. Poems. In Des Imagistes. New York: Boni, 1914. 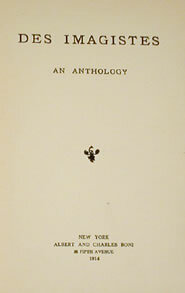 In many of Pound’s short poems published in 1913 and 1914 one can trace his experimentation with lessons that on his own evidence he had learned from the ‘hokku’ (see especially 12), as in the following works from the first Imagist anthology, all of which are condensed adaptations of Herbert Giles’s translations from the Chinese (collected in History of Chinese Literature [London: Heinemann, 1901]), and all of which are reprinted in Lustra (20). a. Liu Ch’e. Six lines that rely as directly as In a Station of the Metro (3), April, and Gentildonna (5) on the ‘hokku’-derived technique of super-position. b. Fan-Piece, for Her Imperial Lord. Pound plays not only with the ‘form of super-position’ but also with the syllabics of hokku, condensing Giles’s ten lines of iambic pentameter to three lines of 5, 7, and 7 syllables. Miner (A25) finds that the work ‘comes closer than perhaps any other attempt to meriting the title, “a haiku in English”’. See also 111.
c. Ts’ai Chih. Again Pound’s self-conscious setting forth of a single-image poem—that ‘present[ation of] an intellectual and emotional complex in an instant of time’ (see 2)—reads like a translation not of the Chinese verse from which the poem derives, but of a hokku, from which Pound has learned some of the important lessons of Imagism (see especially 3 and 12): ‘The petals fall in the fountain, / the orange-coloured rose-leaves, / Their ochre clings to the stone’.